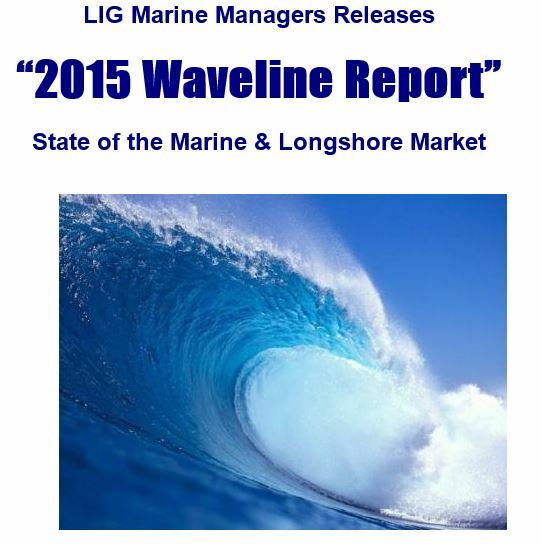 St. Petersburg, Florida, June 18, 2015 – LIG Marine Managers announces the release of the new “Waveline 2015 - The State of the Marine & Longshore Market Report.” Get your free copy now by clicking the link: WavelineUS.com! The Waveline Market Report commissioned from LIG’s national survey in early 2015 is designed to gauge a fair representation of the true state of the Longshore and Marine Insurance Market. This survey measures the changes in Price and Availability of Longshore and Marine Insurance over calendar years 2014 versus 2013, includes projections for 2015, and provides comparisons with markets since 2006. The “Waveline 2015 - The State of the Marine & Longshore Market Report” encompasses a fascinating overview of the State of the Market for Longshore, Blue Water, Brown Water, MEL, Cargo, MGL/SRL, Docks & Piers, Marinas & Boat Dealers, Yachts/Personal Boats & Charter Sightseeing Boats, Account Size Rate History, and Policy Delivery Time. Get your copy of this valuable report at WavelineUS.com.